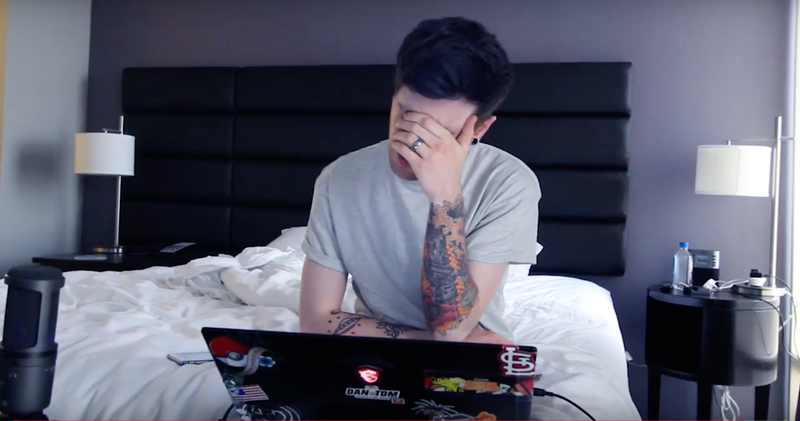 YouTuber DanTDM, frustrated over a loss in spinz.io. You can check out his play through here. You may be sick of hearing about fidget spinners by now, but that’s too bad. The toy is still blowing up on YouTube, where content creators are playing an Agar.io-inspired game called spinz.io for millions of fans. The game has only been out for a couple of weeks, but there are already over 260,000 videos dedicated to it. As a fidget spinner, you travel across a white grid filled with colorful dots that serve as either fuel or food. The dots seem to just be magically absorbed by the device. As you collect the dots, you increase your RPM, meaning you spin at a faster rate. The goal is to reach the top of the player boards and become the fastest fidget spinner. The faster you spin, the more likely you can knock players out of the game. If a player has a speed four times faster than you, they will kill you with one hit. You can either play alone, or do a team mode, where you can join up with other players to gain higher rankings and dominate the server. Here I am, desperately spinning away from my doom. Players seemed to avoid me, which was nice of them. However, as I became more confident and powerful in my abilities, I started craving power and speed. The fast paced environment of the game means anyone can overcome you at any time, so you must always be competitive. Eventually, I found myself running straight into weaker players who desperately tried to spin away from me. I couldn’t help it. In the end, the highest rank I got was a 7. You gain ranks by getting faster, and you can lose ranks by either dying or losing points from other players knocking into you. Unfortunately, at the peak of my power, I died, and my reign of terror came to an end. Part of the reason why spinz.io is blowing up right now is that popular YouTubers such as Jacksepticeye, Pewdiepie, DanTDM and SSundee have made videos of the game, each one amassing over a million views. Like other io videos, the playthroughs are entertaining scream fests. It feels good to watch as players mercilessly destroy the competition and desperately scramble from the higher level players to avoid death. There is a thrill in both losing and winning. Some YouTubers play for fun, while others challenge themselves to reach their highest RPM and dominate the server. In Jacksepticeye’s playthrough, one player, “UKRAINE,” reached an RPM of 15,666. But players can spin even faster and higher than that—from what I have seen, the game has no limit as to how high you can go. Created in 1993 by chemical engineer Catherine Hettinger, fidget spinners were originally marketed as a way to relieve stress and help people—particularly those with ADHD— focus, although experts are skeptical about that. These glorified Beyblades didn’t become a meme until this year. The trend has particularly blown up on YouTube, where there are now over 9 million videos related to fidget spinners, many of them racking up millions of views. Fidget spinners are so popular, many YouTubers are now selling them. While you have to pay for a real fidget spinner, spinz.io is free, and with the added thrill of competition, might be more fun than the actual toy.